Traveling across America with Kristina and Jack – Life! Kristina, Jack and I are crossing America this week. Kristina is moving to Boston to get her Master’s degree in Education at Boston University. I am really glad that I get to help her drive her car to Boston. It’s not very often that I get to spend so much one on one time with one of my children and I really cherish it. We are laughing a lot and really enjoying this time together. We started Monday evening by driving to Park City to spend the night. We had a great dinner and called it a night. It had been a long day moving her furniture to storage in Bountiful and then loading the rest of her stuff into the car. While I did help move the furniture, and boy it’s not easy getting a queen size mattress out of a basement, she did virtually all the loading of the car. 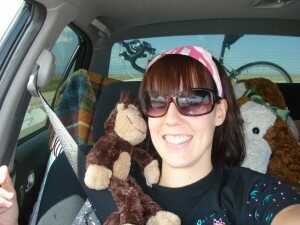 Tuesday, we drove to Grand Island Nebraska. Wednesday we decided that we could get much farther than our planned stop near Chicago and Kristina set the goal to make it to Ohio. At 10pm we stopped at a Holiday Inn Express just 13 miles across the Ohio border. Today we covered Ohio (stopping at Kirtland) and Pennsylvannia. We are now in Palmyra, New York. We stopped at the Hill Cumorah on our way in and will see the rest of the church history sites tomorrow before heading east again, this time to Boston! I am jealous of you doing the drive out thing with Kristina. I can relate to that love of one on one time. I even enjoy the alone time of driving out alone to be there to help. Driving across America is quite an inspiring option we sometimes take for granted (believe me, right now we live on a narrow island-you can relate to island life and not having a car to pop into and go where you want, whenever you want on your own)! Good luck to Kristina. I know you two made the most of the drive—cool stuff! Don’t hurt your backs moving into the apartment! What a great thing to do! Enjoy and be safe!